Envision your family in this RARE ENTRY LEVEL home with a LARGE BACK YARD, located on a quiet street in the heart of Lake Nona's desirable Laureate Park. Before you even open the door, there is a covered front patio with plenty of space for an outdoor sitting area to enjoy the neighborhood and relax. 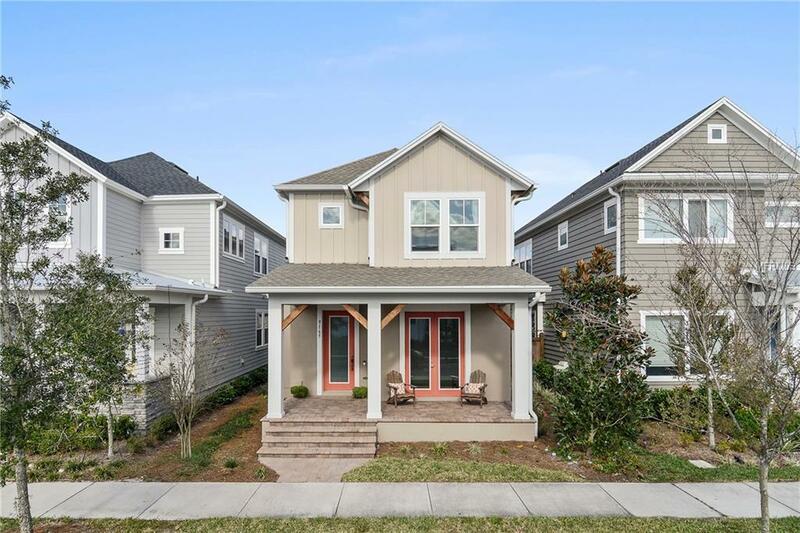 This beautiful 2-story home features two bedrooms, two & a half bathrooms, an enclosed study with French doors, & engineered wood floors throughout the downstairs! Tall doors throughout the first floor compliment high ceilings in the family room, which also has upgraded light fixtures, recessed lighting & several windows throughout to bring in plenty of natural light. The kitchen boasts several upgraded features including granite counter tops, cabinetry, designer hood & stainless steel appliances. Crown moulding & walk-in pantry make this kitchen delightful to cook in, but the HUGE ISLAND with a built-in sink really sets it apart! Upstairs there is a loft space perfect for a playroom, additional living room or could even be converted to a 3rd bedroom. The Owners Retreat features trey ceilings, crown moulding & a large master bathroom with double sinks & a spacious super shower. You will not find many large, private backyards like this one in Laureate Park. Just minutes from Lake Nona's Medical City and Town Center, this community offers many amenities including a resort style aquatic center, fitness center, community garden, playgrounds, & access to 44 miles of walking, jogging, and biking trails. Additional Lease Restrictions Buyer Should Verify Leasing Restrictions With Hoa And County. Pet Restrictions Buyer Should Verify Hoa Policies & Restrictions Regarding Pets As Well As County Restrictions. Listing provided courtesy of Keller Williams Advantage Iii.